(CNS): Immigration staff have recently undergone training in changes to the law that governs the work they do. 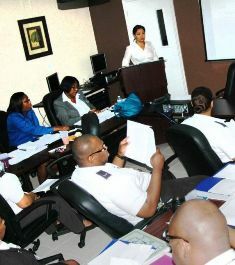 More than 100 employees of the department as well as representatives of the Cayman Status and Permanent Residency, Business Staffing Plan, and Work Permit boards, and the Enforcement and Border Control team took part in the work shop facilitated by local attorney Angelyn Hernandez. Chief Immigration Officer Linda Evans and her management team said they believed it was useful for all staff to have an overall understanding of the key areas of the law and regulations which was fully implemented last October. “This review is already proving to be worthwhile. The public will undoubtedly derive benefits from having a department which is up-to-date and knowledgeable on matters of the immigration laws and regulations,” Evans said. Conducted at the end of last month the refresher course covered the intricacies of the updated Immigration Laws and Regulations. “This is just part of an ongoing effort to equip staff to better-serve our customers,” Evans added.